The 75 per cent hike in tuition fees (now spread over seven years, but indexed) would remain, albeit with slightly liberalized access to scholarships and loans, and provision for repayment of loans geared to future income. A provisional committee would examine university budgets and propose possible cuts. Each dollar cut would go to reducing incidental fees not related directly to tuition (admission, registration, sports services, technology, etc.). The committee would include four students, but also fourteen other members: 6 university rectors, 4 trade union representatives as well as 2 representatives of business, 1 from the ministry of education, and a chair with a tie-breaking vote – the latter four all designated by the minister of education. The committee would table its recommendations by December although if necessary its mandate could be extended by one more year. It might then be replaced by a permanent committee appointed by law, its composition undetermined at this point. Pending the provisional committee’s conclusions, the students’ incidental fees would be deferred. However, these fees would apply retroactively to the students in any amount the committee is unable to cut from current expenses. There is no assurance that the proposed committee would agree on budget cuts sufficient to reduce or eliminate the hike in tuition fees. Furthermore, the committee would be composed largely of members with a vested interest in opposing cuts in expenditures, especially in research and funding of pro-business courses. Most importantly, the offer, if accepted, would trivialize the key demands advanced by the students throughout the strike movement: for an immediate freeze on tuition fee levels, increased access to quality education and a public debate on the long-ignored goal of free and universal education from kindergarten to university. It would force the students into a market-driven accounting exercise, striving to justify cuts in spending on infrastructures, research, courses and teachers’ salaries – just when students and professors have struck a responsive chord among many Québécois with their united campaign against the underfunding of public post-secondary education in the province. Small wonder, then, that this miserable “offer” is being rejected overwhelmingly by students across Quebec. And thousands are continuing to march for hours each night through the streets of Montréal, in spontaneous demonstrations that began some two weeks ago in rejection of an earlier offer by the Liberal government. In continuing their boycott of classes, which has shut down the majority of Quebec’s major post-secondary educational institutions, the students are courageously risking loss of credit for an entire semester. They have led an exemplary struggle, conducted since the beginning with mass democratic assemblies and decision-making. The three main student organizations – the CLASSE, FEUQ and FECQ – have maintained a united front in the face of repeated government attempts to divide them and isolate the more radical CLASSE from the other two groups. They have withstood vicious media attacks on them as a selfish elite, and the exploitation of a few, isolated acts of violence against property (often by Black Bloc anarchists) to portray the students as little more than publicity-seeking vandals. They have successfully defied more than a dozen court injunctions ordering universities to reopen and professors to teach. And they have resisted massive police repression that has resulted in the arrest of well over 1,000 students and serious injury to some as a result of the cops’ use of rubber bullets, concussion grenades and tear gas. But by themselves – notwithstanding these heroic actions – the students have been unable to create a social relationship of forces sufficient to break through the unyielding opposition of the government and the business class it represents. They have won significant support from some community grass-roots groups, including a broad-based Coalition against privatization and user fees for public services. 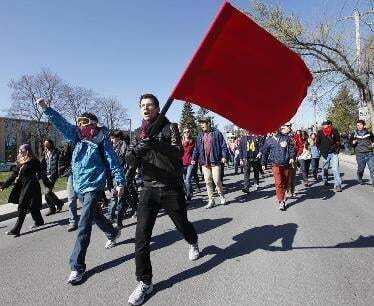 The Coalition was a prime organizer of the massive demonstration at the Liberal party’s general council meeting May 4-5, held in the town of Victoriaville in the futile hope of avoiding pro-student demonstrations in Montréal. Notably missing, however, has been active solidarity from Quebec’s trade unions, whose million-plus members represent the largest social force with the potential economic clout to defeat the government and business assault on the students. The major centrals and many local unions have issued statements in support of the students, and some have contributed funds to their organizations. But they have made no effort to organize economic action, even a one-day general strike in support of the students’ demands as requested by the CLASSE. And now their central leaders appear to have been accomplices in the government’s latest manoeuvres with the students. By the 12th week of the student strike, the government was coming under a lot of pressure not only from the students but from the university and college administrations, which feared they would be faced this fall with a double cohort of students in the wake of a cancelled semester – an enrolment overflow they are not equipped to accommodate. Furthermore, a mounting series of disclosures of scandals and corruption implicating government ministers in lucrative construction contracts, illegal party financing, and even possible connections with organized crime – as well as widespread criticism by First Nations and ecologists of Charest’s showcase Plan Nord program to expand mining in Quebec’s far north – have undermined the government’s legitimacy and fed rumours that Charest is planning to call an early election before the Liberals are outflanked by the opposition Parti Québécois or ultra-neoliberal Coalition Avenir Québec. However, the student unrest jeopardizes this scenario. The government’s response was to call a meeting on May 5-6 with the rectors and student representatives in an ultimate attempt to bludgeon the students into a deal that would, it hoped, rescue its credibility and restore order in the schools. And in a shrewd move, it invited the presidents of Quebec’s three main union centrals, the FTQ, CSN and CSQ, to attend this summit, held simultaneously with the Liberal party’s general council meeting in Victoriaville. The formula proposed by the education minister seems to draw in part on a proposal first advanced by the two relatively conservative student organizations. The FEUQ and FECQ had suggested that the tuition fee increase might be avoided through equivalent cuts in unnecessary expenditures by the universities. The CLASSE, for its part, fought to maintain the focus on the fee hike and the broader perspective of free post-secondary education. However, its own proposal, adopted a few days later, noted that funds for higher education could be found through cuts in business-oriented research programs (not basic or theoretical research) and competitive advertising by universities; a moratorium on infrastructure expansion, including additional satellite campuses; and an immediate freeze on pay and hiring of senior university management personnel. The CLASSE also called for an “estates general” on the future of Quebec education, in which it said it would advance the demand for free education, which could be financed by a capital tax on financial institutions. And it drew attention to the huge profits being registered by the major banks, even amidst the economic crisis. Although there were significant differences in the proposals of the respective student groups, there were clear parallels. The FEUQ and FECQ were retreating somewhat from the earlier focus on tuition fees. The CLASSE was clearly striving to maintain a united front while appealing to other forces in the community to engage in economic action in support of its overall demands. A call for a social strike appeared on the CLASSE web site, although a discussion of this proposal, scheduled for debate at two successive meetings of its weekly congress, was postponed for lack of time. And, as mentioned, it received no response from the forces to which it was primarily addressed. Remarkably, Quebec’s major trade union leaders – experienced negotiators in hard-fought bargaining with businesses and governments – apparently advised the student leaders to accept the shabby offer presented to them by the Charest government. Although to date little has been said publicly about their role, it is hard to avoid the conclusion that their intervention did nothing to aid the students’ struggle and may in fact have undermined it. Judging from this week’s votes rejecting the offer, however, hundreds of thousands of students have not been taken in. Their anger, and renewed mobilization, may even be preparing the way for a new advance. Richard Fidler is an Ottawa member of the Socialist Project. This article first appeared on his blog Life on the Left. 1. Coalition large de l’Association pour une solidarité syndicale étudiante; Fédération étudiante universitaire du Québec; Fédération étudiante collégiale du Québec. Also participating in the negotiations was the TaCEQ (Table de concertation étudiante du Québec), which represents about 65,000 students at McGill, Laval and Sherbrooke universities. It broke with the FEUQ in 2005. 2. Fédération des travailleurs et travailleuses du Québec, Confédération des syndicats nationaux, and Centrale des syndicats du Québec. Also participating was the FQPPU, the Fédération québécoise des professeures et professeurs du Québec.